Consider this scenario. A sniper guarding the Olympic Stadium spots a man pulling out a gun. In less than a minute, the man could kill or injure dozens. But the sniper is too far away for a simple shot. To hit the gunman and save lives, the sniper will need to factor a maddeningly complex set of variables. It’s not easy. Which is why the Pentagon’s far-out researchers at Darpa have been working on laser-emitting targeting computers for America’s snipers. 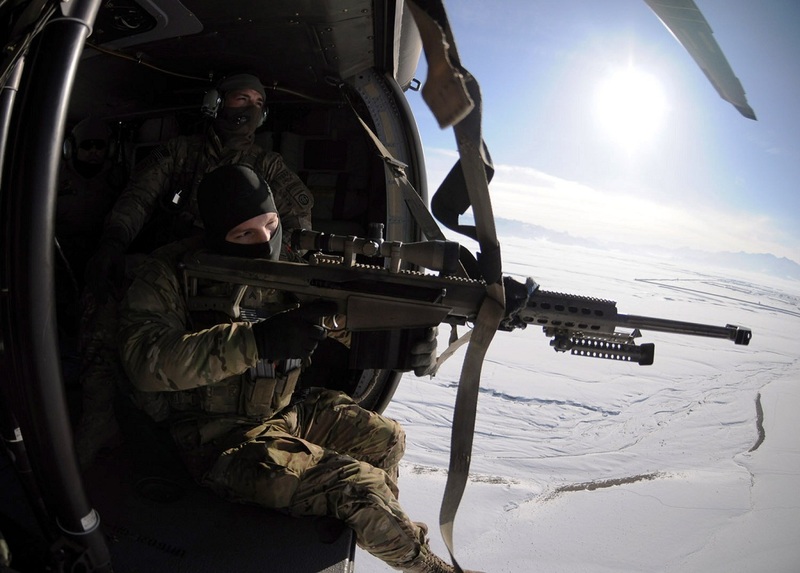 The goal is to reduce the number of calculations the sniper and his teammate — a spotter — have to do before they can make an accurate shot. Darpa also wants to build the devices small enough to simply clip onto a rifle, making the spotter optional and turning the sharpshooter into a super sniper. On Wednesday, Darpa awarded a $6 million contract to Cubic Corporation’s defense division to develop the device, called the One Shot XG. The company couldn’t respond by press time, but according to Darpa’s solicitation for proposals, the new device is intended to be a “compact observation, measurement, and ballistic calculation system” (.pdf) that is mounted onto a sniper’s rifle or scope, allowing accurate shots “under crosswind conditions, at the maximum effective range of current and future weapons.” The little device should also be able to handle calculations in near real time and handily feed the data into both the gunsight and a handheld display screen. Sniper teams currently have to figure out a lot of their ballistic data with calculators. The data includes range, temperature and atmospheric pressure, to keep it short. More importantly, the speed of crosswind — the wind moving perpendicular to the firing line — has to be factored as well. Snipers have to use their intuition and training to guess the wind speed, or use time-consuming anemometers, which lose accuracy with wind speeds above a few miles per hour. Range finders are used to measure distance, but these can be imprecise. Many contemporary laser range finders emit a beam that can’t be seen by the spotter, which makes it difficult to tell whether the beam is focused on the right spot. The lasers have to be carried separately, adding weight. Current scopes often have stadiametric range finders built into their reticules, but even these lose accuracy at long distances. But to get it to work in the field, Cubic is going to have to fix some problems with the XG’s predecessors. When tested, earlier iterations improved the odds of hitting a target at one kilometer by a factor of four, their batteries lasted a paltry 20 minutes and wouldn’t measure range correctly when relying solely on battery power. Sunlight also had a tendency to drown out display data inside the scopes. And the laser range finders overheated after 10 to 15 minutes of continuous use. Darpa wants the XG to stay cool, be smaller, and have 10 prototypes ready for testing in 15 months. The agency also has to keep up with a new generation of deadlier, longer-range sniper rifles that can hit targets up to three-quarters of a mile away. Darpa is trying to engineer guided bullets, too. Whether the XG comes in on time, though, is hard to say. One Shot has been consistently behind schedule. The tools were supposed to have been fielded in 2009. This was later bumped to 2011. Now the military wants them by late 2013. There’s also a big gap between developing a prototype and fielding a battle-ready weapon.